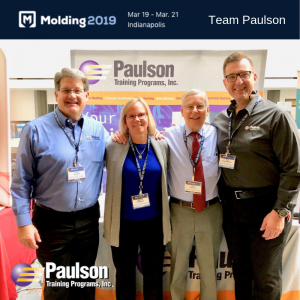 Don Paulson, Chairman of Paulson Training, did a lot of the pioneering research that informs the plastics industry today. 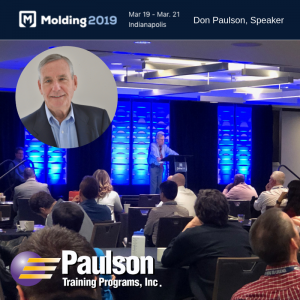 And in March of this year, Don took the stage at Plastic Technology’s Molding2019 Conference held in Indianapolis, In, and gave the audience a history lesson in molding in his talk, “The History of Training in the Molding Industry”. In it, he spoke about the widely batted around term “scientific molding”. While the term “Scientific Molding” was popularized by noted engineer and molding expert, John Bozzelli, also a speaker at the conference, through his seminars and many articles, the components of scientific molding have been around for some time. It all really started, believe it or not, back in the 1960’s with research done by Don when he set up the most advanced plastics research lab in the country at what was then called General Motors Institute (this was where GM ensured that the growing company would always have an adequate supply of engineers (there is a VERY instructive lesson there for any growing plastic’s processing company today). Don Paulson discovered that the plastic only reacted to 4 primary variables – heat, flow, pressure and cooling. Sounds obvious enough today, but back then it was very novel. So much so that only the most advanced injection molders took notice, General Motors, Kodak, Polaroid and the Tech Group being 4 of them. This also became known as looking at the injection molding process from “the plastic’s point of view”. These core concepts are what is at the heart of “scientific molding” today and what Don espoused in his presentation at the Conference. Learn more how training can help your company reach success. Contact one of Paulson’s training specialists for a custom package right for you, 860-526-3099 or email tedc@paulsontraining.com.